Are you after AMAZING results in your horses overall health? Sick of adding extra salt, toxin binder or prebiotics to your horses feed – why not make it simple!! 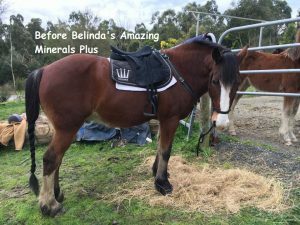 Belinda’s Amazing Minerals Plus is a ‘all in one’ product to save you time and money. One dose, one product, suitable for all horses all year round & extremely palatable (even to the fussy ones will eat it). Balanced, Easy to use, Economical, Time saving & Amazing Results! Provides your horse with a custom-made vitamin, mineral & salt supplement to be added to feed (not waterproof like the Loose Lick). Keep your horse healthy with the added benefit of Elitox ® to help alleviate your horse of mycotoxins along with improving gut health and improves nutrient availability with added Diamond V XPC ®. Great for growing or older horses that need help with nutrient digestibility & gut health. * Hoof issues * Laminitis *IBS * Mud fever * Rain scald * Itchy Skin * Stringhalt * Scouring *Sunburn & photosensitivity * Ryegrass staggers * Balance the diet * promote a healthy shiny horse! 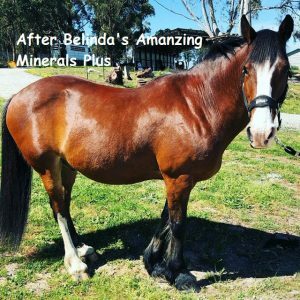 Belinda’s Amazing Minerals Plus contains Elitox ® Power-mycotoxin Eliminator with high quality antioxidants & vitamin C (Elitox dose not bind vitamins and minerals like other toxin binders can). Diamond V XPC® fermented yeast culture, prebiotic for gut health. Also provides Vitamins & minerals to balance your horses diet (A-Z): Biotin, Boron, Calcium, Copper, Folic Acid, Iodine, Magnesium, Manganese, Niacin B3, Phosphorus, Salt, Selenium, Sulphur, Vitamin A, Vitamin B1, Vitamin D3, Vitamin E & Zinc. *Note on Elitox; Elitox is a unique combination mycotoxin eliminator for use in all equine diets safe to use all year round. Elitox has been shown it does not bind or degrade dietary micro-nutrients such as vitamins and minerals. Ingredients promote and benefit a healthy digestive tract. 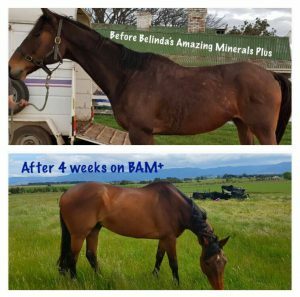 BAM + is not waterproof & Does not contain molasses, no added Iron or cobalt (BAM+ is suitable for racehorses). 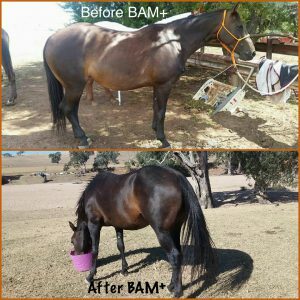 BAM+ is designed for horse owners that want to add their health supplement to feed. Look at the amazing results on BAM+, try it for yourself and see the results!! You can also offer Belinda’s Premium Custom Weather Shield Loose Lick free choice in the paddock, if the horse decides it requires more than what you are giving in feed.